I have a trampoline in the bottom corner of my garden. It's done a brilliant job of getting my son outside but is an absolute eyesore. It's black and orange. I am going to lay weed matting underneath with bark on top. I'm then going to put something like fruit netting around the base to make sure my youngest can't get underneath it. It is secured in position with extra stakes but there is still a little general movement from the bouncing. It is situated in the corner where two borders meet. The borders are mostly shady though a plant would get a few hours of morning sun if it creeped around to the side. Would this be possible? I thought a plant may detract from the hideousness of the orange padding even if it doesn't cover it entirely. Or is this a terrible idea? Hi Splandy . Sounds like a good screening idea to me. I'd use something soft but tough for either side of the entrance gap, it's bound to get trodden on at some point. How high are the legs? I got some hard wearing black netting from B&M which is practically invisible when up. Think it was about £2.99 for a 1x5 metre roll. I'd use plastic cable ties to attach it to the legs. I can't find many pics online either. I saw one with a few ornamental grasses. I think a low evergreen hedge type of thing would give good coverage. Maybe a mix with small leaved hebe, variegated euonymous etc. I'll need to have a think about other plants. I'm sure there will be more planting suggestions from others. Yes, good point about it getting trodden on. I was asking more about the idea of growing climbing plants along the netting rather than things in front of it since the borders are at the back and I'll be eating into the lawn if I create a border in front. Do you think climbing plants would be too delicate for this? I could bring the border out slightly on two sides so the lawn curved round where the trampoline is, but I don't particularly want a border all the way round. Though I do want to screen it from a nearby bench a much as possible. I'm not sure I'm explaining this very well, I'll see if I can upload a photo. The border to the right (which hasn't been properly created yet) will curve out from there so I could curve it a little into the trampoline before it comes up the garden. The border at the back could be curved out very slightly so that it is covering a little more of the trampoline from the side, as the bench is to the left of this photo. Still not sure it's clear but hope so. If it's a bit on the shady side, how about some of the variegated ivies ? I don't know how well they would cling to the netting - depends on how stiff it is I suppose. Are you intending it to be a permanent feature ? The trampoline I mean. Clematis would cling but depends how shady is shady ? A photo is a good idea - may bring forth a few more suggestions for you. Yes, I think the trampoline will be there for quite a long time. My youngest is only 1 now so it has many years of use ahead. I won't move it around the garden. The garden is south west facing, so the bit at the back is almost always in shade, perhaps a little bit of sun just reaching it from the side in the morning. I suppose I could put some proper plants in where is comes close to the borders and try a climber where it gets slightly more sun. Would I need quite stiff netting for a climber? I've never grown one before. It would probably need some tying in to establish it onto the netting as it grows. That's ok - looking back at my original post I didn't make it very clear. I think curving the borders into the trampoline a little and planting is a good idea anyway for extra screening. Do you think an ivy is the only climber robust enough to cope with this? Ah.........the pic helps Splandy but you are going to have to do a bit ( ? ) of work on the ground if you want something to grow in that situation. If you could make a decent enough border, would it be possible to erect a bit of trellis top to bottom around 3 sides ? 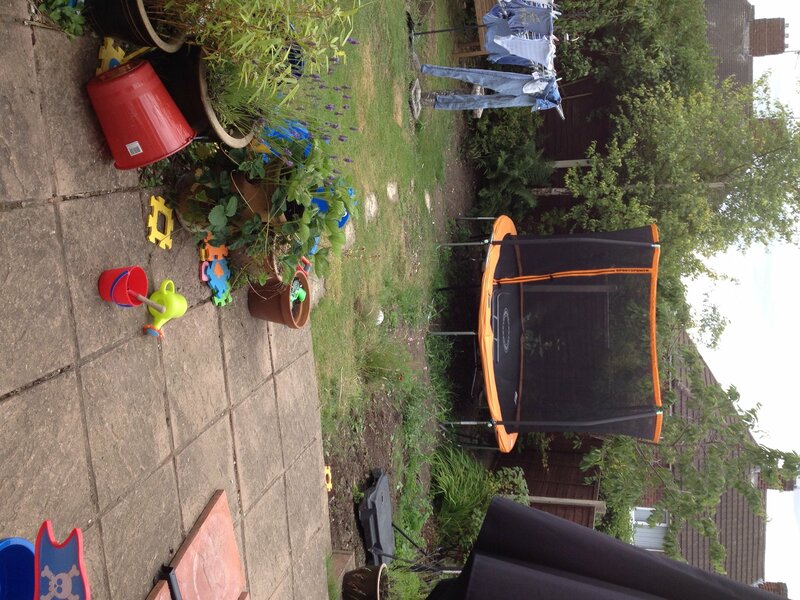 Leaving a gap for your little person to access the trampoline ? As a temporary measure, some plastic greenery tied on to the orange bits may at least be a bit easier on the eye and give you time to think of the alternatives. No experience of either children or trampolines so my suggestions could be rubbish. Hopefully someone will come along and be able to help you in a more constructive manner. Yes, the garden is very much a work in progress! I've had to push back most of it after unexpectedly digging out two skips worth of rubble. Thought it best to delay turf laying and border creating until autumn now with the weather being so hot, so this is just planning time. I hadn't considered attaching trellis. That could be good. Definitely only at the base though, the safety netting can't be up near anything solid as there is a bit of give in it and it could cause injuries if they hit it. Not sure whether attaching something rigid would work with the movement. I suppose I could put low, freestanding trellis right next to it though, just at the bottom, so it isn't attached to the trampoline itself. I'm not sure whether anything I try is just going to look ridiculous because, realistically, there is no hiding the large, orange trampoline at the bottom of the garden!